Support Childhood Cancer Awareness and give hope to others that they too can win the fight against cancer. Because every child deserves a chance, wearing this Personalized Childhood Cancer Shirt, you will help spread awareness to those around you so that one day we will find a cure. Our Personalized Survivor Shirt is available on our premium 100% cotton T-Shirt, machine washable in youth sizes XS-L and adult sizes S-3XL. Includes FREE Personalization! Personalized your Cancer Awareness Shirt with any name and three line custom message on the back. Additional Info By showing awareness, you will help support Childhood Cancer and also help fund research for a cure. Be sure to also promote awareness with any of our Childhood Cancer Awareness Apparel and Walk Gear. 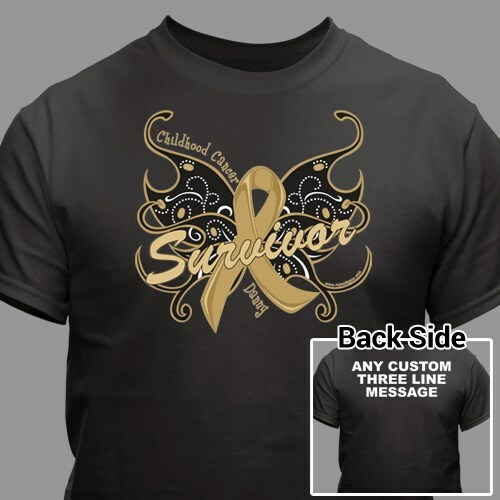 View our Childhood Cancer Survivor Long Sleeve Shirt and our Childhood Cancer Butterfly Keychain as well. Feel good knowing that for every purchase made, MyWalkGear.com will donate a portion of the proceeds to help find a cure.